Bio (The author) was one of 451 young men to become a Navy Flight Officer in 1980 and the only one that year to become a much-feared-and-respected Topgun instructor; an honor awarded only to the “best of the best.” So when Hollywood green-lighted an obscure script for a movie about the elite Naval Fighter Weapons School (aka Topgun), they knocked on Bio’s door, and the rest is history. Top Gun the movie quickly became an out-of-nowhere, runaway blockbuster that earned $353 million worldwide, catapulted Tom Cruise into superstardom, and made American fighter pilots a cultural icon. A Story of Perseverance -- how he overcame airsickness during dynamic maneuvering in flight training. First Person Faceoffs in the air at 700 MPH! A Cold War Perspective - aerial missions to neutralize Soviet bomber threats. Life-or-death adventure -- how he survived a split-second ejection from a crashing F-14. Tidbits - How Topgun students receive their call-signs -- “Bio” is short for bionic, which rhymes with Baranek, Dave’s last name. The first takes of Top Gun—which had to be redone because they were inaccurate or improbable—to wrapping day. Bio’s first time being spotted by giggling teenage girls during the making of the movie. Dozens of full-color photos of Bio’s planes, flights in action, Tom Cruise on set, and Hollywood parties, including a picture of Tom Cruise kissing Bio’s wife! A glossary of flight terms and important Topgun information. I am not a pilot, nor will I be, but in this book the author takes you on a ride you will never forget! In reading this book you simply are taken behind the veiled curtain and into the inner sanctum of Top Gun. As a fan of the original movie, it was very cool to read accounts of the school, and the movie all in one. The book was written in such a way that anyone can understand, without technical jargon. 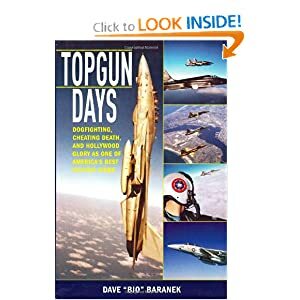 Instead the author has written a true-to-life account of Miramar and what it took to be a part of the elite Top Gun program, as well as what it took to be a part of the making of the hit Hollywood movie. There were so many moments that were heart stopping in the book, but one that stands out was the moment by moment accounting of the author's ejection from an F-14 into the Indian Ocean. Never before have I read something that was so blunt, honest and true. This was a great read and one that I would highly recommend to anyone interested in flying or anyone interested in an action packed tale - it will keep you on the edge of your seat!